This mechanism is designed to prevent large bursts of events on an agent from negatively impacting the network or the manager. It uses a leaky bucket queue that collects all generated events and sends them to the manager at a rate below the specified events per second threshold. This helps to avoid the loss of events or unexpected behavior from the Wazuh components. 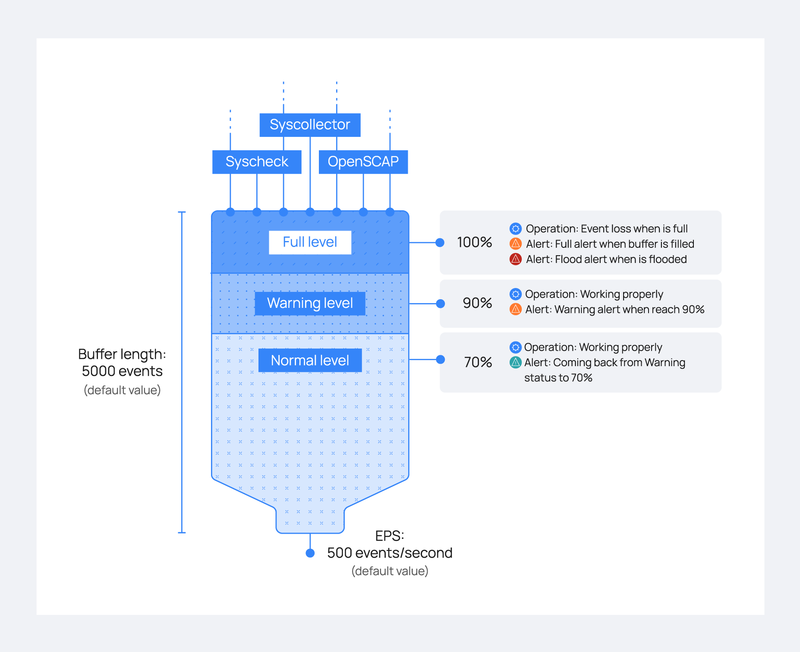 Additionally, agent modules can be configured to limit their event production rate, reducing the risk of saturating the leaky bucket’s buffer. In the Wazuh architecture, Wazuh agents collect information from log files, command outputs, different kinds of scans, etc. They then send all the collected information to their manager, separated into individual events. Without any congestion control, an agent could potentially send events at a rate as high as the system is physically capable of transmitting, which could be hundreds or thousands of events per second. Events are generated every time a file under a Syscheck-monitored directory changes. If Syscheck monitors a directory which changes constantly, it will generate a large volume of events. In addition, if the monitored directory contains any file to which Wazuh writes when it generates an event, like /var/ossec/queue/, it will cause an infinite loop. A Windows firewall event (ID 5156) is generated each time an outbound network connection is allowed. When this event is enabled in Windows, and Wazuh is configured to monitor all Windows Security Log events the result is an infinite loop. When the agent connects its manager, it generates a Windows firewall event that in turn causes the agent to connect again to its manager. When certain applications encounter an error, like disk full for instance, they may generate an error log entry and retry given the task over and over again hundreds of times per second, generating a massive volume of events. Each of these scenarios may well create such a high rate of events that the functioning of the agent, network, and/or manager may be significantly hampered. This provides event congestion control with an agent-side leaky bucket queue to guard against saturation of the network or of the manager by an agent. This mechanism uses internal limits in different components of the agent, controlling the rate at which they generate events. As mentioned above, the leaky bucket is a congestion control located in agents and focused on agent-to-manager communication. It collects events generated on an agent in a buffer of a specified size (default 5000 events), and sends them to the manager at a rate no higher than a specified number of events per second (default 500 EPS). These values need to take into account the needs of your specific agents, manager, and network environment. The following graphic shows how the bucket works. There are several levels of control for the bucket with the aim of being aware of the buffer status and being able to foresee and address a potential flooding situation. Warning alert: The first control will trigger an alert on the manager when the occupied capacity of the buffer has reached a certain threshold. By default it is set at 90 percent. Full alert: After the first control, if the buffer gets filled, another alert will be triggered on the manager. This new alert is more serious than a warning alert because a full bucket will drop incoming events. Flood alert: This alert is generated if more than a configurable amount of time passes between a full alert event and the buffer level dropping below the warning level. Normal alert: This alert is generated to announce that the buffer level has returned to normal (by default <= 70%) after having previously triggered a warning alert or higher. In the <client_buffer> section of Local configuration it is possible to disable the buffer, configure the size of the buffer (in number of events), and configure its throughput limit measured in EPS, or event-per-second. Disable buffer: This parameter disables the use of the leaky bucket, resulting in no restriction on the rate of events transmitted by the agent to the manger. This is how previous versions of the agent were set up. Queue size: The queue size is the maximum number of events that can be held in the leaky bucket at one time. It should be configured according to the expected rate at which an agent may generate events. This value is set to 5000 events by default, which is a generous buffer size for most environments. Events per second: This is the maximum rate at which events will be pulled from the agent’s buffer and transmitted to its manager. The default is a generous 500 EPS, but this should be set with consideration of the capacity of the network and the number of agents a manager is serving. This configuration is also available in Centralized configuration which means it can be set in agent.conf with the aim of configuring agents’ bucket options from the manager side. When an agent is configured by agent.conf, that configuration overrides its own local configuration. To allow the agent to have final say about a minimum number of EPS it will be allowed to transmit, regardless of the EPS limit configured at the manager level via agent.conf, another variable called agent.min_eps can be set in the agent’s Internal configuration. In Internal configuration, there are more advanced options related to buffer operation. Specifically, the warning and normal level thresholds, plus the tolerance time for triggering a flooding alert can be configured. In this section, it will be shown how the leaky bucket acts when faced with an extreme situation. For this purpose, the following graphic shows different phases of the buffer’s usage when it is receiving more events than expected, and how it acts step by step to manage the situation. As the graphic shows in the left area, the buffer is working normally, receiving and sending events. In this situation, no buffer alerts are triggered on the manager. However, a large amount of events can provoke an increase in the buffer usage, causing it to reach the warning level, which here is set at 90 percent. Despite this alert, no events have been dropped because there is still free space in the buffer. It is important to understand that when the buffer is full, all newly arriving events will be dropped until free space opens up in the buffer. For example, if in one second, 1000 events arrive to a full buffer with a throughput limit of 500 EPS, 500 of these events will be stored and the other 500 will be dropped. When the buffer is 100% full, a timer is started which is compared to the tolerance time set in internal_options.conf. The use of the buffer decreases to below the warning level before the timer reaches the tolerance time. If this occurs, no alert about flooding appears on the manager. This graphic illustrates this situation. The use of the buffer stays above the warning level until the specified tolerance time has elapsed. Now, it appears that the buffer may not come back to a normal status by itself. For that reason, a more severe Flooding status alert is triggered on the manager. If the conditions in number 2 above are met, where the buffer stays above the warning level beyond the defined tolerance time, the Flooding status alert is triggered. Note that the alert description warns the user to check the agent since it is probable that it will not recover to a normal status by itself. Remember that a flooded agent is dropping events. The right area of the graphic shows how the buffer returns to a normal status after it hits 100%. This could happen because a module ceases generating excessive events either because something has completed or because the offending module was shut down manually. When the bucket is in this status, no events are dropped. In order to avoid agent buffer saturation followed by event loss, the event production rates of Wazuh agent daemons that could cause this saturation have been limited. Logcollector: If a log file is written faster that logcollector can read it, this can negatively impact the proper functioning of the agent. For this reason, the agent will restrict itself to reading no more than a configurable maximum number of lines from the same file per read cycle. OpenSCAP Wodle: This module previously sent the entire set of scan results as soon as a scan would complete. It now sends the scan information to the manager at a regulated speed so as to reduce the likelihood of maxing out the buffer. These are advanced configurations located at Internal configuration. The variables defined for this purpose are called logcollector.max_lines and wazuh_modules.max_eps and much care should be given when changing these values.